Flight time 10hrs 40mins from London. 17hrs 30mins from NYC. Here at Black Tomato, we are always looking for the next big adventure destination. We’ve covered just about every inch of the globe; from navigating the waterways of Papua New Guinea to the Steppe of Mongolia, there isn’t much we haven’t seen. That’s why we get so excited when we discover somewhere new and exciting. So, with that in mind, let us whisk you away to The Congo. This African gem is just begging to be discovered; so get there before everyone else and fall in love with its vast rain-forests and abundant wildlife. World’s apart from the neighboring DRC, The Congo is regarded as one of the safer African nations. Trek, kayak, and cruise through the heart of the Odzala-Kokua National Park and unleash your inner Tarzan as you track endangered Western Lowland Gorillas and wade through the Lango bais in search of Forest Elephants and Buffalo. This eight-night adventure is a world away from the safari game drives that Africa is so well known for. With the help of a team of local researchers, you’ll get up close to some of the continent’s most fascinating wildlife – without anyone else getting in the way. Fly over the luscious rainforest and into the heart of Odzala-Kokua before jumping in a 4×4 and winding your way through jungle tracks to your first camp. Over the next week, you’ll hop between the three Odzala Discovery Camps: Ngaga, Mboko and Lango. These stunning lodges have been built with the environment in mind, using indigenous materials and sustainable energy, but are anything but rustic. 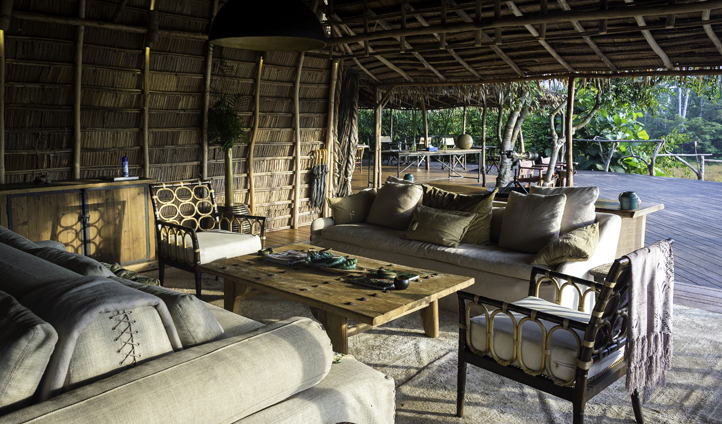 Each camp varies slightly on the others, but all have breathtaking views, delicious meals, en-suite bathrooms and are the perfect space to retreat to after the rigours of a day in the jungle. Your first stop is Ngaga Camp, where you will spend the next three nights. Ngaga really is gorilla central, so get to know the gorilla research team and learn all about the conservation efforts in the area. You’ll then tuck into a delicious dinner to gear you up for a day in the jungle tomorrow. In the morning, lace up those boots as you set off on your first gorilla trek. Along with an expert guide and skilled tracker, you’ll navigate the dense rainforest, interpreting signs on the forest floor to find the elusive gorilla groups. There are thought to be around 105 individual gorillas in the area, belonging to seven groups, with two of these groups being habituated around the camp. So whilst sightings are never guaranteed – we’d bring a camera if we were you. After a camp lunch looking out over the forest glade, head back out on a forest walk and get closer to nature than ever before. The trees here are absolutely full of chimpanzees and their noisy hoots and screams will provide a musical backdrop to your walks – though they’re easier to hear than they are to see, so keep your eyes peeled. Tomorrow, you’ll start the day with another gorilla trek – as a second chance for those who were unlucky yesterday and a bonus treat otherwise. You’ll then spend the afternoon with the ever passionate research team, learning more about these majestic creatures and how you can help protect them. In the early evening, head out on a night walk for a glimpse into nocturnal forest life and its most secretive inhabitants. The forest is full of nocturnal primates and you should look out for the bizarre and unique Potto and Angwantibo who, though tricky to spot, make for good viewing as they cling motionlessly to tree branches. Elsewhere above your head, you’ll hear the unmistakable calls of the Hammer Head Bat. Look up into the canopy and we’d almost put money on you catching sight of this, Africa’s largest bat. Tomorrow morning, if you still haven’t quite got your gorilla fix, you can choose to head out on a third and final trek before leaving Ngaga Camp. Otherwise, spend a lazy morning lying in bed and looking out at the luscious green forest, courtesy of the 360-degree views from your forest lodge. Then from Ngaga, it’s onto Mboko Camp, where a whole other raft of adventures awaits. On your way to Mboko, you’ll stop off at Mbomo village to meet the friendly locals and get a rural dose of Sunday village life. Mboko is the largest of the forest camps, with 12 canvas cabins built alongside the Lekoli River where you will often spot grazing Forest Elephants and Buffalo. After a camp lunch overlooking the wide-open grasslands, take to the river for a whole other view of forest life. With visibility clearer here than it is within the canopy, you’re in for a treat. Though chimpanzees are undoubtedly heard, they are rarely seen but their cousins the Putty-nosed and de Brazza’s monkeys can usually be seen swinging through the trees along the riverbank. If you don’t catch a glimpse of these mischievous jungle dwellers today, tomorrow we’ll get you even closer to the action as you paddle off on a guided morning kayak on the river. Don’t worry too much about getting wet though – it won’t matter once you begin a walk upstream to Lango Bai. These swampy, grassy clearings in otherwise dense rainforest are the wildlife’s favorite jungle restaurant – and Odzala-Kokua is full of them. Whilst this riverine forest is full of forest elephants and buffalo, if you quietly stalk the river trails you may also be treated to sightings of Red River Hogs and a myriad of shy forest birds. You’ll spend the next two nights at Lango Camp where labyrinthine raised walkways create a treetop-like atmosphere. It’s enough to bring out the big kids in us all. In the morning, you’ll set off on another adventure walk – perfect for studying the finer details of the forest. The walks around here truly are adventurous in every sense of the word – expect to return to camp with wet and muddy shoes (at the very least) as evidence of your escapades. After you’ve washed yourself off in a steaming hot shower, spend a leisurely afternoon watching a rainbow’s worth of birds flying over the camp deck. On your final day in this unspoiled land, go undercover in a bird hide and watch for African Grey Parrots over the bai. With their distinctive red tails, they really catch your eye against the ever-present backdrop of green. To tick the essential African safari adventure off the list, you’ll then head back to Mboko Camp via a game drive. In a literal rumble through the jungle, it’s a whole other perspective once more. You’ll take a short drive where you can then stretch your legs and take a beautiful meandering walkway through the forest to Mboko. In a trip which is no doubt resplendent with wildlife – and ways of seeing it, your final activity is down to you. 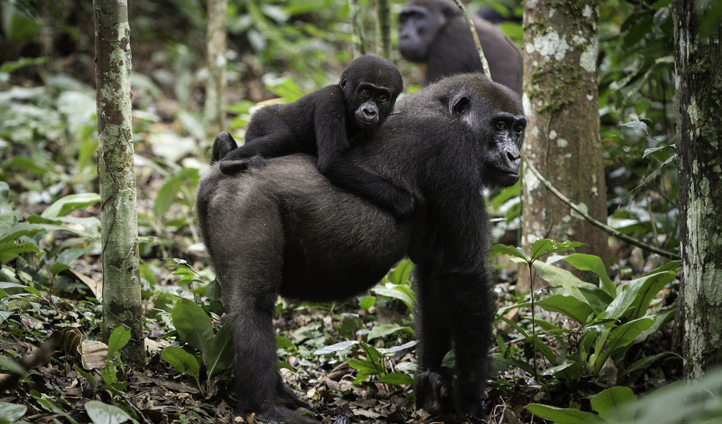 Whilst we’re afraid it’s goodbye to the gorillas, you can still set off on either a river cruise on the Lekoli or take one last walk on the wild side. The choice is yours. In the morning, enjoy a final forest breakfast before flying back to Brazzaville where your adventure sadly comes to a close. But no matter what happens, you can always say that you were in the Congo first. So what are you waiting for? Go, go, GO.